As a fashion designer, I am often inspired by the many fashion magazines and catalogs that I receive. 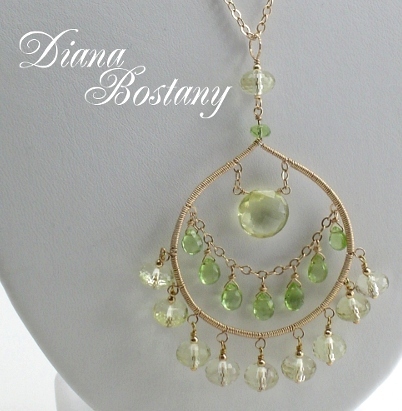 Most recently my fascination with “Lemon Lime” (Lemon Quartz combined with Peridot) was sidetracked by Peruvian Pink Opals and Diamonds. And while the earrings I saw were obviously castings set with diamonds – not beaded – it made me want to do something along those lines. 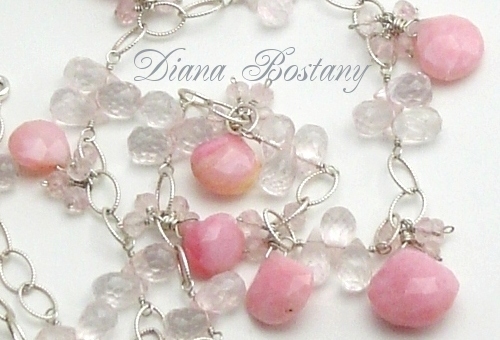 The tea rose color of Pink Opals combined with something very sparkly . . . perhaps diamonds . . . maybe crystal quartz. 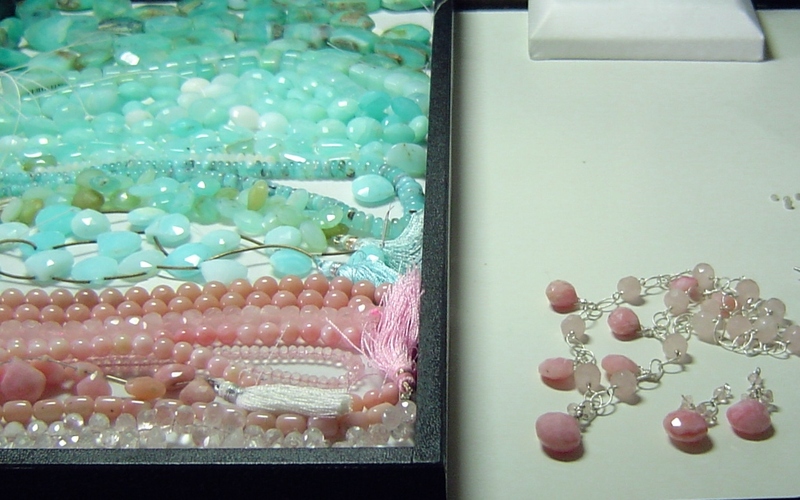 In the end, I chose faceted rose quartz – for it’s soft pink color and translucent quality. That said, I can’t help but admire my collection of Peruvian Blue Opals . . . those may have to be next. 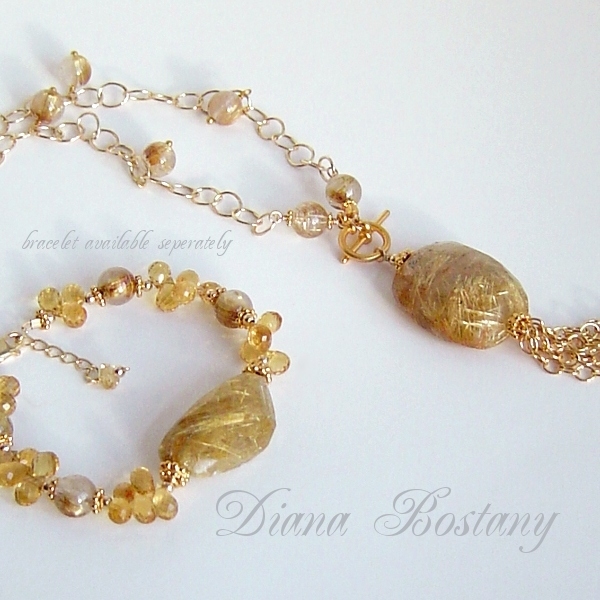 As the sun spilled across my desk and onto the beads, the golden needles sparkled like crazy within the stones. It was as if they were speaking – and before long “we three kings” came to mind. The newly fallen snow had covered every branch and sitting by the window I knew it was cold – I could feel it coming off the glass. But the golden stones made me warm. “We three kings,” I repeated to myself. It shall be regal yet wearable. Fancy yet somewhat simple. The large link chain that had just arrived was the perfect balance to the nugget I had selected for the pendant. I hadn’t thought of a tassel initially. But the more I thought of kings, queens, and castles, the more it seemed appropriate – appropriately lavish. When the piece was finished I tried it on immediately. 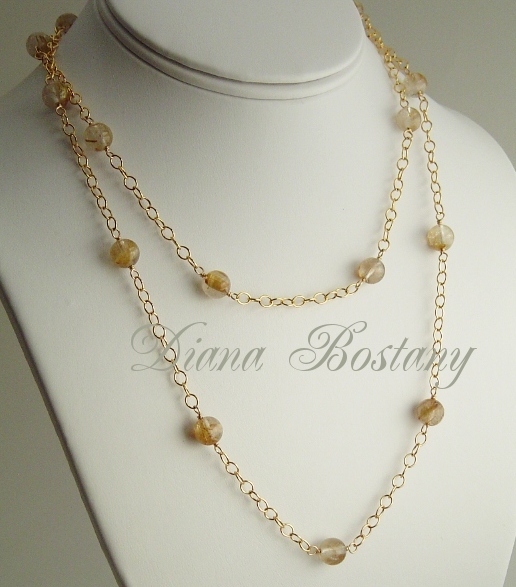 The coolness of the stones felt lovely against my skin – as did the chain tassle. I imagined it being worn with a long, full black velvet skirt, a wide black belt – with scrolls of passimentarie for texture, and a crisp white cotton shirt with the collar turned up, 3/4 length sleeves and fancy French cuffs. “But what if she wanted more – more sparkle?” I thought. So, the next piece was created as an add on – to be worn long or doubled. Or to be worn alone with a dress or jeans. The rounds were pricey due to their quality – AA grade – so I tried to use them sparingly. 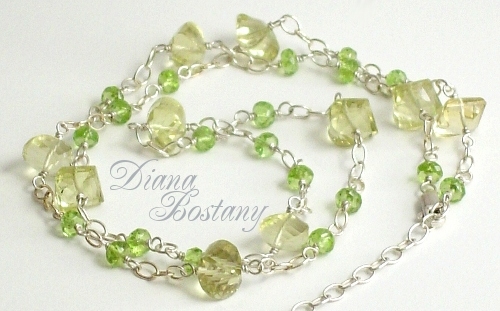 But as I thought of a coordinating bracelet, the beads I chose to enhance the faceted nugget would have to be special. You see, bracelets are usually viewed up close. More so than necklaces. Only the finest stones could be used. 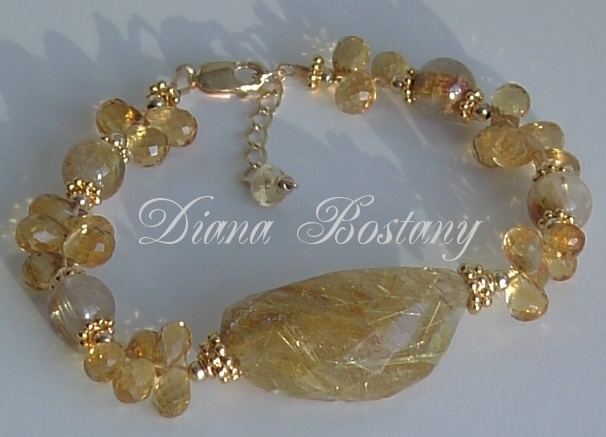 Those AAA Citrine Briolettes that I’ve been saving would be perfect! Not only would they provide sparkle and shine but if clustered, they will give the piece some girth – or heft. For if she were only to wear one bracelet, it should be somewhat substantial to contrast with the airy necklaces. And so, now that I’ve had my fill of Golden Rutile Quartz, the beads shall be put away until the next urge arrives. For with the warm weekend that just passed, my thoughts have turned to Lemon Lime.